This spring, two new coaches will be at the helm of the Lynnville-Sully golf team. The first-year co-coaches, Mike Moran and Jennifer Kramer, will be leading 13 golfers through the 2018 season. Both coaches are looking forward to the competitions ahead. The team welcomes back two returning girl starters, juniors Tessa Van Maanen and Kayla Van Dyke, and two returning boy starters, junior Abram Collins and senior Holden Jansen. Also joining the team are six first-year golfers and three returning non-starters. Kramer commented on the mix of individuals. “We have a good group of senior leadership as well as ones that are coming back that have played the game and know the rules,” she said. This year's seniors include Jansen, Hailey Scandridge, and Skyler Young. Practice officially began on Mar. 14. “The season usually starts off pretty chilly,” said Kramer. The team tries to hold practice outside as often as possible, but weather conditions can make that a difficult task. Moran commented on the early weeks of practice. “We've had a great first week of practice and are eager to see what our golfers can accomplish this season,” he said. The L-S girls tee off their season at Pella this Thursday, Mar. 29. The following week, the Hawk boys and girls host Montezuma and North Mahaska at the Diamond Trail Golf Club in Lynnville. 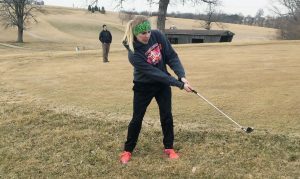 Senior Skyler Young works on her swing during an early-season outdoor practice at the Diamond Trail Golf Club. 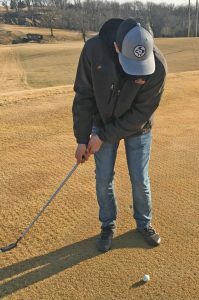 Senior Holden Jansen works on his short game during an outdoor practice last week at the Diamond Trail Golf Club.